South African born, Linda Jordaan currently lives in Cape Town and has been on her own personal spiritual journey for many decades. Linda is an experienced Shaman who practices the Sacred Andean Tradition. Linda was initiated during October 2009 to Kuraq Akulleq (Master/Teacher) initiate, by her Peruvian Teachers. She mentors and teaches the Sacred Andean Tradition and provides training and Initiations to apprentices. In addition, Linda is skilled in, and practices many metaphysical healing modalities, which she also teaches. She also facilitates various initiation rites namely: Munay-Ki Rites, Nusta Karpays, Rite of the Womb Initiations and Lightarian Institute Attunements. The latter is transmitted in person and/or remotely. Furthermore, she practices as a Counsellor and a Traditional Doctor. 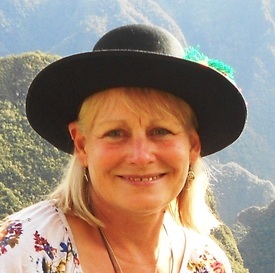 Linda is an experienced Journey Leader of Soul-journeys to magical, mystical Peru, Ireland and England. Having always had a fascination for sacred places, Linda has spent much time within Ireland, England and especially Peru, where she has taken part in and facilitated various initiations, activations and ceremonies within many places of power / sacred sites. She brings with her vast personal experience, knowledge and wisdom that will enrich your journey. Linda is closely connected to Mother Earth’s living energies and the Cosmos. She is the channel and author of a Quantum Healing card deck that is in the process of being published. She is also developing a Quantum Healing modality for the current time. In the Inca tradition, there is no separation between the physical and spiritual worlds. Jorge Luis Delgado is expert at walking the path between both worlds. He received his early training from Kallawaya Shamans of the NE Lake Titicaca region, the lineage of the Wise Ones of the Andes, and from the Q'ero Elders of Cusco, who are the last remaining tribal descendants of the Incas. Author of 'Andean Awakening: an Inca Guide to Mystical Peru', Jorge Luis is recognized worldwide as an authority on Inca philosophy, spirituality and tradition. He was featured in the BBC documentary 'Everyman' and is frequently interviewed on Peruvian television. Jorge hosted the 2nd Elders Gathering at Lake Titicaca in March 2007, the Activation of the Solar Disc gathering in 2010, The Portal 11-11-11 in 2011, The Portal 12-12-12 in 2012 and The Good neighbourhood in the Cosmos last 2013. Every year he organizes a special journey with international and national speakers about different items. He has offered workshops in North, South and Central America, as well as Europe. Jorge teaches annually at New York City's Omega Holistic Institute and at the New York Open Center. Jorge Luis has brought to public attention the Aramu Muru Doorway, an Inter-dimensional portal located in the Huya Marka mountains in South Peru. He is also a founding member of The Brotherhood of the Solar Disc, an Andean Esoteric society. Jorge Luis is a way-shower for this 10th Pachacuti, this time when the world is being turned upside down. He teaches that a new consciousness is emerging, one leading to a Golden Age that was fully activated by 2012. He is a Keeper of Ancient Knowledge and uses it to assist in healing for all who are ready. Jorge Luis Delgado is the founder and owner of Kontiki Tour Company and owner of hotels in Cusco, Aguas Calientes (Machu Picchu) and on the shores of Lake Titicaca. 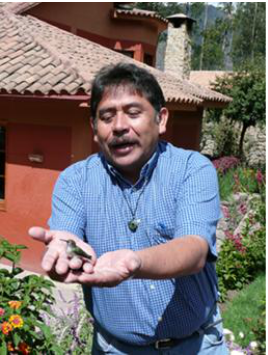 Most importantly, Jorge Luis is known and respected by the Andean priests and indigenous people of the region. In addition to his native Spanish, Jorge Luis speaks fluent English, as well as three indigenous languages. He has a vast collection of antique textiles and artefacts, which he is currently organizing into a museum at Taypikala Hotel, Cusco. Jorge Luis has hosted and remains in contact with such people as Don Miguel Ruiz, Bo Bingham (grandson of Hiram Bingham) and David Childress, author of the Lost Cities Series. He has taken part in some of the programs about Ancient Aliens of National Geographic. Jorge Luis and his wife have three children. He resides in Puno, Peru.